Eonian Records is a young label based in Indianapolis working a great niche market: discovering and releasing great archival melodic hard rock, much of which comes from the glorious days of the 1980's. Eonian attempts to find overlooked bands with a strong presence, exciting sound and good production with strong regional and sometimes national followings but never got signed. Some of these bands you may recognize because of this, others probably not like Charlemagne and High Noon, both out of LA in the late 80's and early 90's or Pistol Dawn from Chicago. This month Eonian releases two more gems: Shake City from Hollywood and some interesting roots, reviewed below and Uzi, also from Chicago, reviewed separately here. 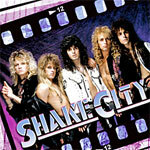 Shake City owes much of its early formation and this recording to another 80's act of some status, Warrant. 'In Warrant�s young, hungry, club-blasting early days, they were fronted by talented singer named Adam Shore, but by the time Warrant started climbing the ladder of mainstream success, Adam was persona non grata and Jani Lane had taken his place.' (Mark Allen) Mr. Shore went on to front and develop Shake City. This debut work also features production work by Erik Turner of Warrant & Tommy Thayer (Black N’ Blue, KISS), and the song Game of War was penned by Jani Lane. What you get on Shake City's debut is some crackin' good hair (and I mean big hair) metal that rocks with fist pumping abandon. This is pure late 80's Sunset Strip hair spray and spandex, chick trolling good time fun. And I'm guessing that, back in the day, the boys of Shake City had plenty of it. Promo material from Eonian points out Betty Blue, Game Of War, Lust & Love, and Submarine as classic cuts, and I would heartily agree. But I would also add three other gems: the crisp and catchy One Good Reason, the superb vocal arrangement of Psychedelic Ride, and the blues-laced Can't Get Over You. On the production side, in parts, Shake City's work isn't quite as strong as the aforementioned UZI, and some of the other unmentioned songs could pass as filler. However, overall Shake City is first class melodic rock that defines its period. Very recommended. Shake City is first class melodic hard rock that defines its late 80's Sunset Strip period with strong vocals, vocal arrangements, and quite catchy hooks. Again, this is another wonderful archival gem from our friends at Eonian Records.